We all might have been in this situation. We parked our cars. Turned ignition off, got out of the car, then closed the door. Then when we were about to lock the car, we found that the window was not fully closed yet. Well, in this situation, it is a hassle to return into the car, turn on ignition, only to close the window(s). We’d certainly wish for a more convenience to address this matter. The summary of the problem is this: As per factory setup, the power windows system can only do its job with ignition on. What we want is that the power windows work with ignition off. 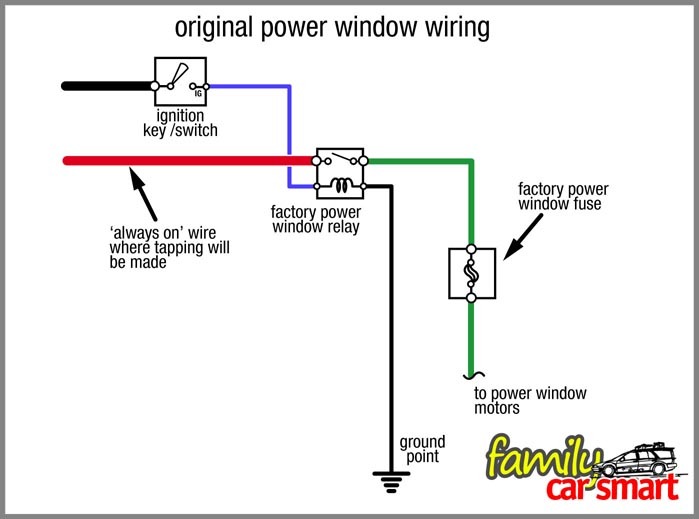 The factory power windows circuitry only receives power when the key (or the car’s keyless) electricity system is at ‘ON’ position, which means that the system requires the ignition to trigger power flow to the power windows system (and other systems /equipment which are powered only with ignition ‘ON’). Car manufacturers design it this way for their respective reasons (I don’t know the actual reasons, probably for security, but the design intrigued me a bit). Because we want the windows to work with ignition off, we would …. … bypass the power windows ignition trigger! Yes, that is what is necessary to make the windows to work with ignition off. We just need to bypass the ‘ignition ON’ requirement to ‘ignition OFF’ or even ‘key not inserted’ position which allows the windows to work. 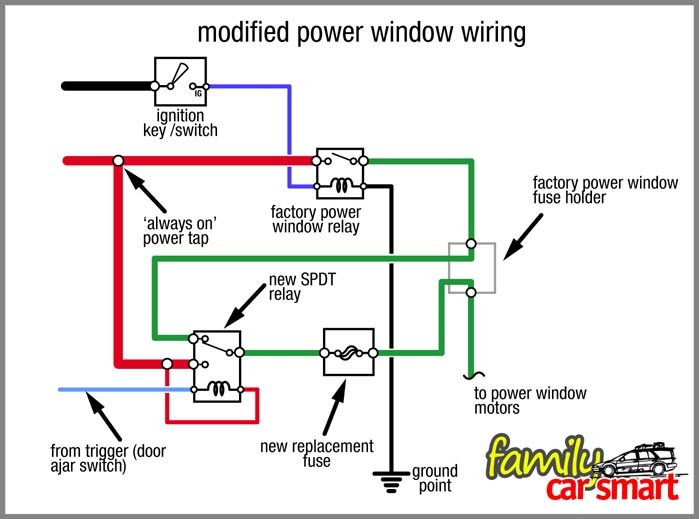 (1) creating an alternative (shift) circuit that gets current to the power windows system when the car ignition is off. (2) giving the new circuit some security. 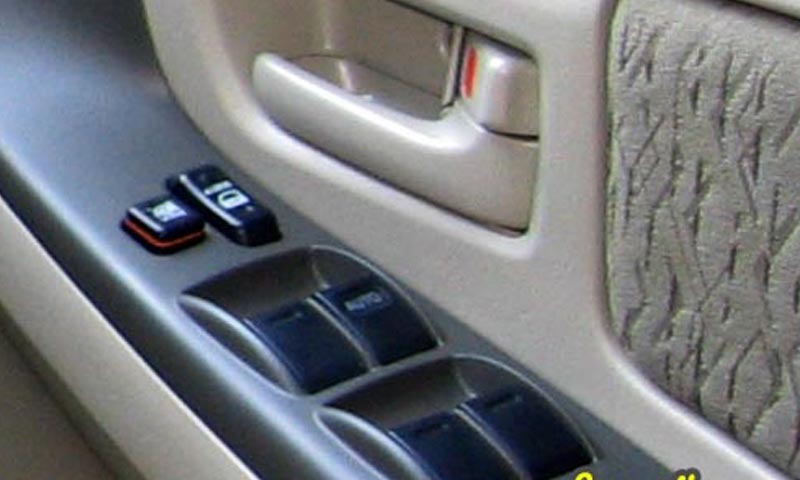 We want this alternative circuit triggered only at a specific condition, so when the condition is removed, the power windows system will return to its ignition on (factory setup) status. So it is still safe electrically, and secure (the window switches cannot work when all the trigger is off). (3) providing the added circuit comparable safety with the original circuit, that is, using wires of sufficient gauge, putting fuse of enough amperage, soldering connections when necessary. (4) maintaining the originality of the car. The new circuit will employ minimum intrusion into the car’s original wires /circuit. Most connections are made using intermediate connectors. What we do is actually creating and installing a power feed shifting circuit. We must find the wire that feeds the windows, then using our shifting circuit, exchange the power supply from that wire with power from an ‘ignition off’ circuit. The car wiring diagram might be required for this. I have created the shifting circuit and installed it on my car. It is a very simple, easy to follow circuit, and was cheaply, very cheaply made. All I needed was several heavy gauge wires, one 40A relay and its socket, several connectors (all then tightly crimped to the wires), one 30 amp fuse to replace the original fuse, my tools, and for safety…. the car’s wiring diagram (this helps a lot in making the modification). Here is sample from the car. The pictures show the wiring diagram, locations of power taps, relay diagram, and actual component locations of the system. The following pictures show the setup. Anyone, from any door position can roll up and down that side window while ignition is off without going to the driver’s seat to get ignition on. After parking at a hot site, the windows can be rolled down immediately even before ignition is turned on. Very useful when we have a child we must lift into the passenger seat before we get to the driver’s position. Can be used in reverse. Anyone waiting in the car, sitting near any door can use a power window button to check whether all doors have been closed tight (if the trigger is the door ajar signal). Here are the points that I considered important concerning the modification. Every car has a specific wiring and layout of components. Even two similar cars with different trims and may have different wiring /fuse block. Since there is power tapped where the original fuse was, another fuse of the same capacity is used to replace its function. Power windows consume quite an amount of current. Tapping wire for ‘ignition off’ should be made by soldering or a high capacity connector. Power tapping from ‘ignition on’ was made at fuse connectors using appropriate connectors. The system should be made with minimum intrusion to the car’s original wiring. The trigger for system shift to the ‘ignition off’ is the door ajar ground input. You can make any trigger, ground or positive, on your preference. An extra alarm channel, such as in a Clifford Avantguard 5.1 (US) or Clifford Concept 650 MKII (if you’re in UK) can be used (these alarms are recommended, for they have anti carjacking feature, which we will review later). Even the domelight switch position will work as well as a trigger. The system I made and installed actually shifts the current supply every time a door is opened, regardless of ignition key status, so the relay works and consumes current every time a door is opened. A switch may be added to turn off this system if it is considered necessary, for example when the car is sent to a workshop which requires door left open for a long period. Before we finish, I’d like to make a statement. Give due attention to safety when making any modification. Subjects discussed in this site shall be construed solely for information /sharing purpose. I assume no responsibility to any damage /injury /loss of warranty whatsoever due to any modification mentioned in any page of familycarsmart.com. Any person who makes the modification shall do so at the person’s own risk. For safety, consult the vehicle manual /wiring diagram. When necessary, consult the car manufacturer concerning warranty, safety, or any risk involved. Thank you for visiting this page. Any comment or question will be highly appreciated. Just leave it in the comment box below. Crikey, you certainly seem to know your stuff. This is something that those who have electric windows, which seems to be the majority now, get frustrated about when a window is left open in error. I’m not sure though, I would be competent enough to make the changes to our car. I suppose someone au fait with electronics would have no difficulty, especially with your detailed instructions to go by. You are truly right that we must check carefully on what we are allowed to do with a leased car before going into a modification. Thank you for sharing about PCP contract. It gave me another idea to write on. Hello there I was reading your website and watched your video about,Family Friendly Power Windows and I think it is a great idea having your system installed and it seems like a fairly easy process to install yourself by looking at your diagrams.I was wondering did you invent Power Windows circuitry?any what a great idea I think it will take off people will love this product. Hi Sonny. Thank you for the response. 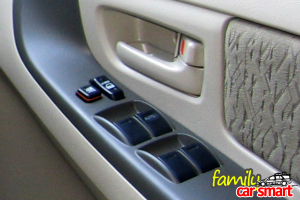 The power windows circuitry is the factory power window system that comes with the car. What I did was only a slight modification to improve its usability. Yes, I also hope that people will love it and it will be useful for the family.